On Feb. 2, 2016, a robotic arm aboard the International Space Station deployed a pair of satellites built by students at Texas A&M University and the University of Texas. DroneDeploy and The Nature Conservancy partnered to create California’s Phones and Drones project, which allows citizens to help create a crowdsourced map of the California coast. An especially bright and powerful aurora over the Pacific Northwest was captured by astronauts aboard the International Space Station on Jan. 20, 2016. The European Space Agency (ESA) Proba-V minisatellite collected imagery in early 2016 of an enormous smoke plume from a bushfire south of Perth in Western Australia. 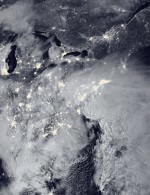 Satellites tracked and helped warn of a major winter storm that hit the eastern United States on Jan. 22-24, 2016, with two low-pressure systems merging to drop heavy snow from Virginia to New England. To raise awareness of Peru’s growing waste problem, a multi-agency collaboration is attaching sensors and cameras to vultures, recording their waste-tracking habits. The European Space Agency (ESA) is calling for Earth-observation scientists to submit proposals for the ninth Earth Explorer satellite mission. Drawing inspiration from an insect's multi-faceted eye, University of Wisconsin-Madison engineers created miniature lenses with vast range of vision. Merrick & Company was recently honored by the American Council of Engineering Companies of Colorado (ACEC Colorado) at its annual Engineering Excellence Awards competition, which recognizes engineering projects that demonstrate a high degree of ingenuity and include significant technical, economic and/or social advancements. The European Space Agency (ESA) plans to track the health of the world’s vegetation by detecting and measuring the faint glow that plants give off as they convert sunlight and the atmosphere’s carbon dioxide into energy.